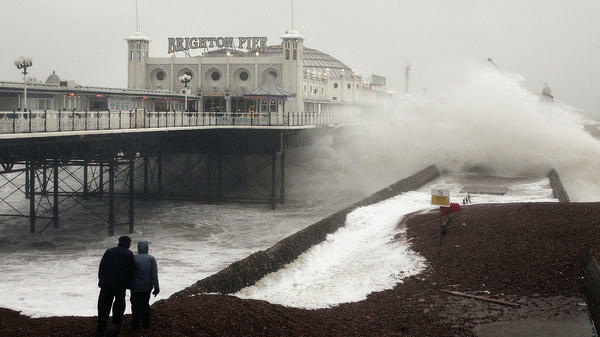 Waves crash onto the beach near Brighton Pier in England, in January 2007. Gale force winds and heavy rain brought disruption to large parts of the country. Severe weather events like this one may be linked to more frequent fluctuations in the polar jet stream, according to a new study. The jet stream is like a river of wind that circles the Northern Hemisphere continuously. That river meanders north and south along the way, however. When those meanders occur over the Atlantic and the Pacific Oceans, it can alter pressure systems and wind patterns at lower latitudes in Europe and North America. And that affects how warm or rainy it is on those continents. Researchers at the University of Arizona and the Swiss Federal Research Institute studied tree rings to get a fix on how widely and how often the jet stream meanders. Biologist Valerie Trouet took samples from four species of trees in Europe, including Scots pine, dating back to 1725. These revealed what kind of weather Europe had each year. And that helped them establish the normal pattern of the jet stream's fluctuations. What surprised the scientists was that the jet stream's meandering has become more frequent. "Since 1960 we get more years when the jet is in an extreme position," Trouet says, either in its northernmost or southernmost position. She adds that this pattern of more frequent, extreme shifts north and south has never been seen before in her 290-year record. Writing in the journal Nature Communications, the researchers say these more dramatic fluctuations may be responsible for some recent extreme weather events, not just in Europe, but also North America. "Heat waves, droughts and floods affect people," says Trouet. These "happen on top of already increasing temperatures and global warming — it's a double whammy." In the U.S., she says, extreme summer heat in the Midwest is also associated with shifts in the jet stream. When these shifts occur as the jet passes over the Pacific Ocean, they affect warmth and dryness in California and the Southwest. While the researchers don't attribute these more dramatic shifts to any one phenomenon, some climate scientists have suggested that oceans warmed by climate change cause changes in the behavior of the jet stream.